I was provided with complimentary Peanut Butter & Co. products to facilitate this review. The opinions in this post are 100% mine. You can read my full disclosure policy here. Peanut Butter & Co. peanut butters are one of the staples in my pantry. When we run low both of the kids and I start to panic and plan our next trip to Target to stock up. Seriously, if you haven’t tried this brand you are missing something special. I’m totally addicted. White Chocolate Wonderful is my #1 pick but a close second, and my kids’ favorite, is Dark Chocolate Dreams. 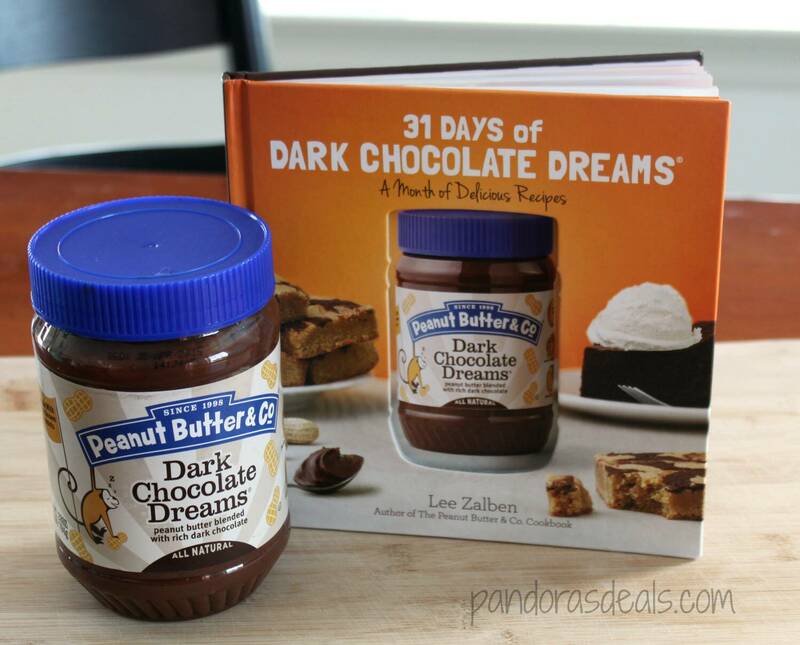 Imagine our excitement when Peanut Butter & Co. sent us a big jar of the good stuff and their brand new cookbook, 31 Days of Dark Chocolate Dreams! This cookbook is amazing. It includes a whole month’s worth of recipes that use Dark Chocolate Dreams peanut butter. I wanted to make a couple to include in this review and I had such a hard time narrowing down my choices. Honestly every single recipe looks sooooo good! And what I love is that they’re really quite easy to make. I didn’t find any that looked like they’d be too difficult or time consuming to bother with. I love that! The next recipe we tried was the Dark Chocolate Dreams Baked Alaska. I’ve had this dessert once before in my life and loved it so much, I still remember it a good 12 years later. But it always looked too difficult to make so I’ve never tried it on my own. The recipe in this cookbook is so easy! I whipped these up for the family and we LOVED them! I’ll definitely be making them again. Peanut butter lovers, this book is a must-have. I am so excited to make more of these recipes for my family. So many great ones to choose from! You can grab your copy of 31 Days of Dark Chocolate Dreams (comes with a 28oz. jar of Dark Chocolate Dreams) on the Peanut Butter & Co. website. And if you want to order peanut butter online, you can do that there too. Amazon also sells it and I usually grab mine in Target. Select grocery stores also carry it. Follow along on Facebook, Twitter and Pinterest to find some awesome promotions and new recipes they share! Great news! Peanut Butter & Co. is offering one of my readers their own copy of 31 Days of Dark Chocolate Dreams plus a 28oz. jar of Dark Chocolate Dreams peanut butter! This giveaway will end on Febraury 17, 2014. You can enter to win [HERE] . They make my favorite peanut butter! Recipes sound great! I love the baked alaska! I would like to try the hot chocolate. I actually have a jar of the chocolate dreams in my cupboard. I would love to try the Truffles recipe. Those look delicious. OOOOOOHHH, that hot chocolate looks good! The crepe cake sounds great! Ohh yumm the hot chocolate!